The Large Antlered Muntjac (Muntiacus vuquangensis) is one of Vietnam’s most elusive and threatened large mammals, and continued pressure from over-hunting and loss of habitat has caused it to be uplisted from Endangered to Critically Endangered on the IUCN Red List of Threatened Species. Khe Nuoc Trong, in the forests of central Vietnam’s Quang Binh Province, is one of the last refuges for the muntjac, alongside many other endangered species threatened by poaching and habitat degradation. World Land Trust (WLT) is working in partnership with Viet Nature Conservation Centre (Viet Nature) to protect around 50,000 acres (20,000 hectares) of Annamite Lowland forest at Khe Nuoc Trong through the Carbon Balanced programme. 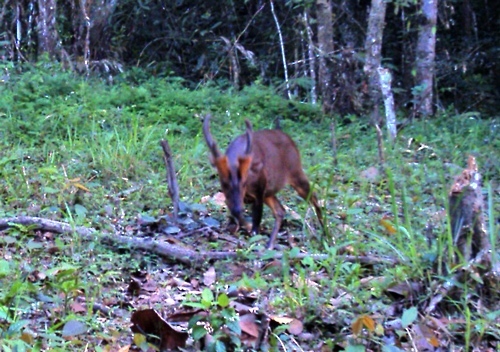 The Large-antlered Muntjac has been recorded at Khe Nuoc Trong, at six different locations. Trail camera photos include one mature male, six mature females and one infant beside its mother, which gives strong hope for the future of this species at Khe Nuoc Trong; if the threat from hunting can be stopped. Mr Le Trong Trai, a leading ecologist and Director of Viet Nature said “Khe Nuoc Trong might be the only area of lowland forest of central Vietnam with a viable population of the Large-antlered Muntjac. This area has significant conservation value at national and international levels; therefore it deserves to be prioritized for protection”. Described in 1994 and first photographed in 2009, the Large-antlered Muntjac shares the same conservation status as the enigmatic Saola (Pseudoryx nghetinhensis), potentially the rarest mammal on Earth, which is also endemic to the Annamites. The Annamite Lowland Forests of Vietnam are home to an incredible wealth of biodiversity, with, 11 species classified as Endangered or Critically Endangered within Khe Nuoc Trong, including the Large-antlered Muntjac and Saola. 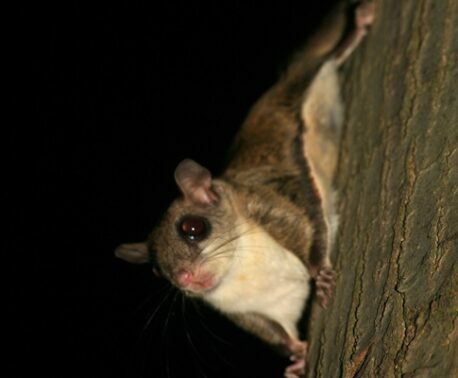 Three species of Endangered primate can be found there – Red-shanked Douc, Hatinh Langur and Southern White-cheeked Gibbon, as well as the Annamite Striped Rabbit and the Sunda Pangolin – one of the world’s most heavily trafficked wild mammals. 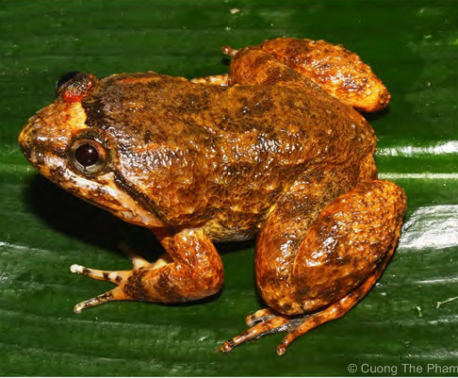 The illegal wildlife trade is a major threat to Vietnam’s rare and endemic species, with recent studies stating that hunting is the single largest problem facing south-east Asia’s wildlife. In 2015 WLT aided in the rescue of Critically Endangered turtles that were being illegally trafficked in Vietnam. World Land Trust is providing improved management of the entire forest at Khe Nuoc Trong, with an aim for the area to be granted the highest level of protection possible through legal designation as a Nature Reserve. Conserving a large area of habitat ensures that species are protected in the first place, free to roam without the threat of being illegally hunted. Rangers deter poachers with patrols and carry out surveys of wildlife supply chains, in addition to snare removal and species monitoring through camera traps. Viet Nature is hoping to capture images of Edward’s Pheasant, a Critically Endangered species thought to be extinct in the wild. There have been no sightings of the pheasant since 2000 but there are populations held in captivity. Khe Nuoc Trong has been earmarked as a potential site to reintroduce the pheasant, as it is one of the best examples of Annamite Lowland Forest left in Vietnam.